All Referrals Come to Us Via FCCS, COMPASS, or Other Institution. Founded by Claire Waters, over twenty-seven years ago, Project Help Clothing Ministry is designed to help the physical body as well as the spiritual soul. The ministry networks with schools, churches, HandsOn Central Ohio (formerly FIRST LINK), American Red Cross, Franklin County Human Services and other Ohio organizations that assist families in crisis. 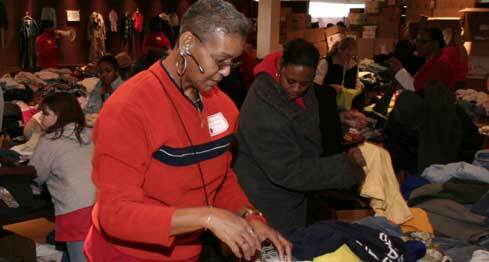 Project Help Clothing Ministry (PHCM) was birthed in Columbus, Ohio, in the Linden area of the city. The vision, now turned mission, brought tangible, clean and quality items to thousands of families. Claire was a role model for other volunteers due to her tenacity, perseverance, courage and commitment to pursue the mission of providing for others. The tedious work and long hours sometimes brought disappointment, which was overshadowed by joy. She used scripture as a source of inspiration to clarify her vision to help others. “There will always be poor people in the land; therefore, be openhanded toward the poor and needy (Deut 15:11).” Claire was relentless in her pursuits for her clientele. Because of her steadfastness, an abundance of assistance via clothing and labor always became available.